When Christmas is over, and it is time to dispose of your tree, there are a few things you need to know about discarding your tree in the cities and towns of Phoenix, Arizona. In most cases, the Christmas trees will be recycled, which has been affectionately termed "tree-cycled," but this also means that the trees are not generally picked up at the same time as your regular trash. These disposal instructions are for fresh-cut trees that have not been flocked or frosted with imitation snow since neither of these products breaks down well. Additionally, unless noted in the guidelines from your city or town, wreaths are not to be disposed of with the Christmas trees, and these instructions do not apply to artificial trees or living potted Christmas trees, which should both be donated to a local charitable organization instead. When recycling your Christmas tree, it is important to remove any decorations, ornaments, icicles, lights, garlands, tinsel, wrapping paper, hooks, nails, metal stakes, and tree stands. Do not bag your tree. According to the City of Phoenix, residents can drop off a single tree and wreaths at one of 14 city parks any time beginning December 26, 2018, through January 6, 2019. Trees should be placed in designated areas where special collection bins are located. Christmas tree drop-off locations in North Phoenix include Deer Valley Park, Paradise Valley Park, Sereno Park, Cactus Park, Mountain View Park, and North Gateway Transfer Station; Central Phoenix locations include Marivue Park, Washington Park, Madison Park, Los Olivos Park, and Desert West Park; and South Phoenix include El Reposo Park, Mountain Vista Park, Desert Foothills Park, Cesar Chavez Park, and 27th Avenue Transfer Station. 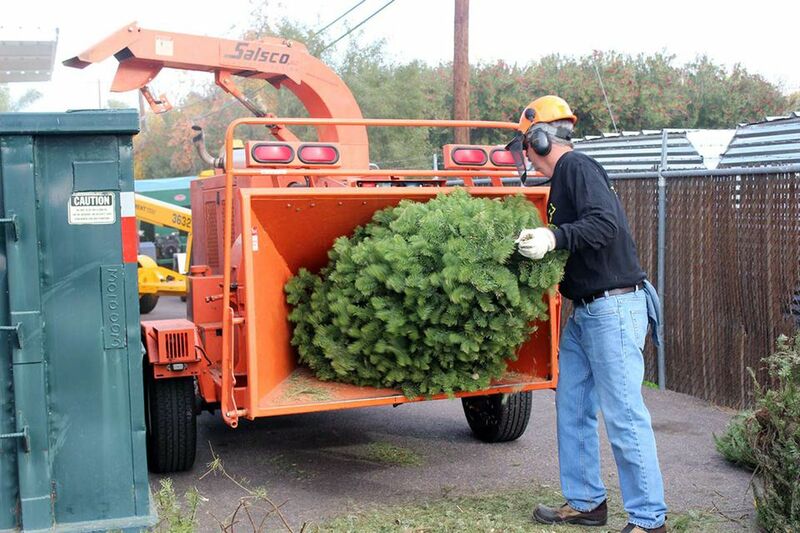 Trees may be dropped off at A to Z Equipment Rental & Sales during the same time period, from 9 a.m. to 4 p.m. daily (except December 31, when the facility closes at noon). Additionally, residents can drop off their trees to be recycled at the "I Recycle Phoenix" festival from 8 a.m. to 1 p.m. on January 5, 2019, at Christown-Spectrum Mall. Meanwhile, container-grown living trees may be donated for planting in the city of Phoenix parks. Every city and town in the metropolitan Phoenix area has its own recycling plan and process. Here is what you need to know about the disposal of your Christmas tree after the holidays. Apache Junction: According to the City of Apache Junction Public Works Department, Apache Junction provides two free drop-off points open 24 hours a day from through the end of January. The locations are Prospector Park and the Paws & Claws Care Center. Buckeye: According to the Buckeye Public Works Department, Christmas tree collection will occur at the curb on the normal green waste schedule. Chandler: For curbside pickup, City of Chandler residents can place their trees at the edge of their driveway before 6 a.m. on their recycling collection day, according to Chandler's Solid Waste Services. Place tree at the end of your property, no more than four feet from the edge of the sidewalk, and do not block the sidewalk or place the tree in the blue recycling container, in the street, alley, or alley containers. Only Chandler residents paying for City-provided solid waste services may use curbside services, but the City of Chandler also accepts the donation of live potted Christmas trees for planting at city parks. Chandler also offers 11 drop-off points for Christmas trees: Nozomi Park, Desert Breeze Park, Arrowhead Park, Shawnee Park, Pima Park, Folley Park, Chuparosa Park, Snedigar Sportsplex, Tumbleweed Park, Recycling-Solid Waste Collection Center, and Veterans Oasis Park. Gilbert: The Town of Gilbert offers multiple drop-off points for Gilbert residents to bring their trees for recycling, according to Gilbert Public Works Recycling. Trees may be deposited in designated bins at Hetchler Park, Nichols Park, Gilbert's Household Hazardous Waste Facility, and A to Z Equipment Rental and Sales. Live 15-gallon or larger potted Christmas trees can be donated for possible replanting at town parks. Glendale: According to the City of Glendale Sanitation Department, residents are encouraged to recycle their Christmas trees by dropping them off at the following sites: Acoma Park, Fire Station #156, Foothills Park, Glendale Heroes Park, O’Neil Park, Rose Lane Park, and Sahuaro Ranch Park. Residents in single-family homes may put the tree out on their monthly bulk trash collection. Goodyear: Goodyear residents can drop off trees from 9 a.m. to 4 p.m. (except December 31 when dropoff ends at noon) at one of four A to Z Equipment Rentals and Sales locations, according to Goodyear Sanitation Services. Goodyear residents may also leave trees at the curb as part of the city’s monthly bulk collection day. Litchfield Park: According to the City of Litchfield Park, the residents of Litchfield Park may drop off their live Christmas trees for recycling on the first Saturday in January. The drop-off site is located just east of Litchfield Park's City Hall. Mesa: The City of Mesa offers five drop-off points for Christmas trees which are open 24 hours a day from December 26 through January 13: East Mesa Service Center, Fitch Park, Superstition Springs Police/Fire Substation, Mountain View Park, and Dobson Ranch Park. Collected trees are taken to the Salt River Landfill and chipped into nutrient-rich mulch and composting products. Tree lot vendors are prohibited; the service is for residential use only. Christmas trees may be taken directly to the Salt River Landfill with a current Arizona driver's license anytime Monday through Saturday between 6 a.m. and 5 p.m. during the month of January. Residents participating in the Green Waste Barrel Program may place their trees inside their green barrel, but the tree must fit completely into the container with the lid properly closed. Curbside pickup also is available for a small fee, but trees disposed of curbside will not be recycled. The City of Mesa also accepts the donation of live potted Christmas trees for planting at City parks. Peoria: The City of Peoria provides multiple locations where residents can drop off their Christmas trees for recycling: Peoria Sports Complex, Walmart (Peoria Avenue); Walmart (Lake Pleasant Pkwy), Home Depot (Peoria Avenue), Home Depot (Lake Pleasant Road), Lowe's (Thunderbird Road), Lowe's (Lake Pleasant Road), and Sunrise Mountain Library (west side of parking lot). Peoria residents are not permitted to drop off trees at city parks or vacant lots, and they also cannot place trees curbside for pickup. Queen Creek: Queen Creek residents can recycle their live Christmas trees at a drop-off location in the northwest section of the lot behind the Queen Creek Library on January 5 and January 12 from 8 a.m. to noon. Trees left for curbside bulk collection must be cut into four-foot lengths and bundled. You must schedule a pick-up for this service. Scottsdale: The City of Scottsdale has an annual citywide holiday tree roundup. If you have a residential collection service, have your Christmas tree curbside by 5 a.m. on the morning the roundup begins. If you miss the roundup or do not have residential collection services, you can drop off your tree at Scottsdale Ranch Park or Eldorado Park, but check with the City of Scottsdale for roundup and dropoff dates. Collected trees will be turned into compost or mulch. Surprise: The City of Surprise offers Christmas tree drop-off in designated areas at Gaines Park (north end of the parking lot), Surprise Recreation Complex, Surprise Farms Softball Park (parking lot on corner of North Willow Canyon Road and West Surprise Loop Drive South), and Asante Community Park (parking lot on north end). Residents have a limit of two trees per household. Tempe: City of Tempe residents can dispose of their Christmas trees 24 hours a day, seven days a week at the Household Products Collection Center or the west side of Kiwanis Park Recreation Center. Both sites will accept trees through the end of January. However, Tempe residents are not permitted to place Christmas trees in garbage containers, but residents may place Christmas trees out for collection during their scheduled week for green waste collection. If your city or town is not mentioned, look for the phone number of the department that handles solid waste collection or recycling, and they will be able to tell you how to properly dispose of your Christmas tree. If you do not live in an incorporated city or town, but you live in Maricopa County or in a county island that does not contract for recycling, you can bring your Christmas tree, cut into three-foot pieces, to a County recycling center. There is a charge, cash only, for each tree you bring.